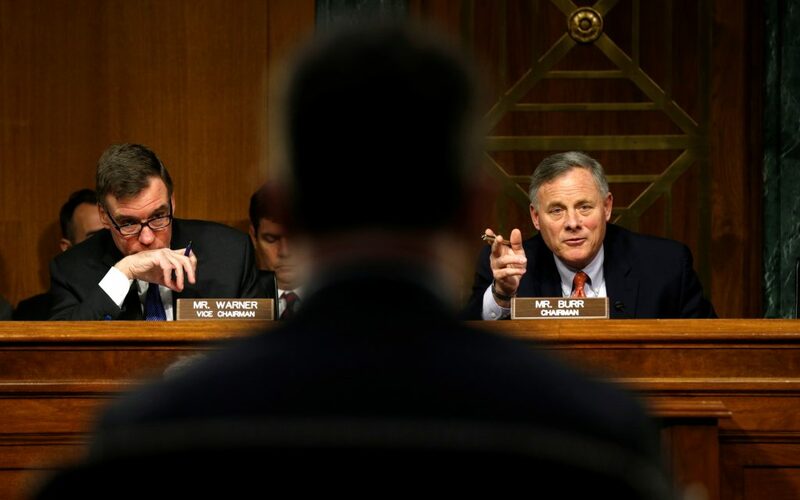 WASHINGTON — Lawmakers heading the Senate intelligence committee focused squarely on Russia as they opened a hearing Thursday on attempts at undermining the 2016 U.S. presidential election. “Russian President Vladimir Putin ordered a deliberate campaign carefully constructed to undermine our election,” Virginia Democratic Sen. Mark Warner said. Earlier Thursday, Putin again dismissed what he called “endless and groundless” accusations of Russian meddling in the U.S. election, describing them as part of the U.S. domestic political struggle. He also said he is ready to meet with President Donald Trump at an upcoming arctic summit. The hearing Thursday is to address how the Kremlin allegedly uses technology to spread disinformation in the U.S. and Europe. Warner and the panel’s chairman, Sen. Richard Burr, R-N.C., provided an update Wednesday of the committee’s investigation into activities Russia might have taken to alter or influence the 2016 elections and whether there were any campaign contacts with Russian government officials that might have interfered with the election process. “There were upwards of 1,000 paid internet trolls working out of a facility in Russia, in effect, taking over series of computers, which is then called a botnet,” Warner told reporters on Capitol Hill Wednesday. Warner said the committee is investigating to find out whether voters in key states, such as Wisconsin, Michigan and Pennsylvania, might have been served up Russian-generated fake news and propaganda along with information from their traditional news outlets. “I think it’s safe by everybody’s judgment that the Russians are actively involved in the French elections,” Burr said. The first round of the French presidential election is to be held next month. Scheduled to appear at the committee’s open hearing are: Eugene Rumer, director of the Russia and Eurasia program at the Carnegie Endowment for International Peace; Roy Godson, professor of government emeritus at Georgetown University; Clint Watts, senior fellow at the Foreign Policy Research Institute Program on National Security; Kevin Mandia, chief executive officer of the cybersecurity firm FireEye Inc.; and retired Gen. Keith Alexander, former director of the National Security Agency and president of IronNet Cybersecurity. Pledging cooperation, Burr and Warner said they would steer clear of politics in their panel’s probe of Russian meddling. They made a point of putting themselves at arm’s length from the House investigation that has been marked by partisanship and disputes. Democrats have called for House intelligence committee Chairman Rep. Devin Nunes to recuse himself because of his ties to the Trump team, especially because the investigation includes looking at contacts that Russians had with President Donald Trump’s associates. Nunes, R-Calif., met with a secret source on the White House grounds last week to review classified material, which he says indicates that Trump associates’ communications were captured in “incidental” surveillance of foreigners. Nunes says he sees no reason to step aside. Burr identified just one of the witnesses: Trump’s son-in-law, Jared Kushner. The White House has said that Kushner, a senior adviser to Trump, has volunteered to answer questions about arranging meetings with the Russian ambassador and other officials. An attorney for Flynn said his client had not yet been interviewed by the Senate committee. One of Flynn’s lawyers, Robert Kelner, said they have had discussions with committee staff members, but Flynn has not been contacted directly.